After Donald Trump delivered his first presidential address to the US Congress, the American stock market hit yet again a record high. Since he was elected, the stock market is up over 11%. The buoyant mood in the market for financial assets is also being mirrored in the views of the top financial analysts. “There’s no question that animal spirits have been unleashed a bit post the election,” remarked New York Federal Reserve President William Dudley, echoing the terms of Keynesian economic thinking that economies take off when entrepreneurs feel optimistic about future sales. And the main economic indicators in the US and global economy have been picking up. The purchasing managers’ indexes (PMI) are surveys of companies in various countries on their likely spending, sales and investments. 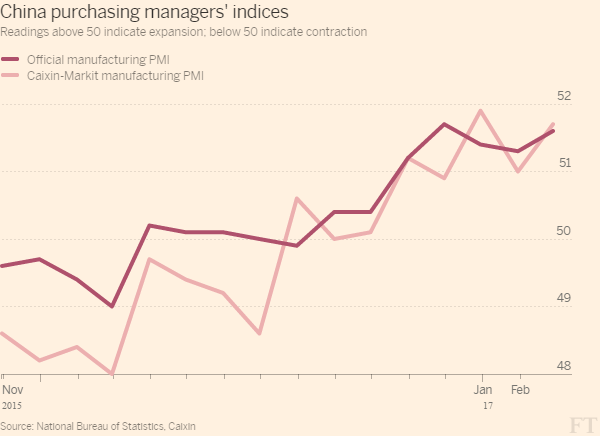 And the PMIs everywhere are well above 50, meaning that more than 50% of the respondents are seeing improvement. 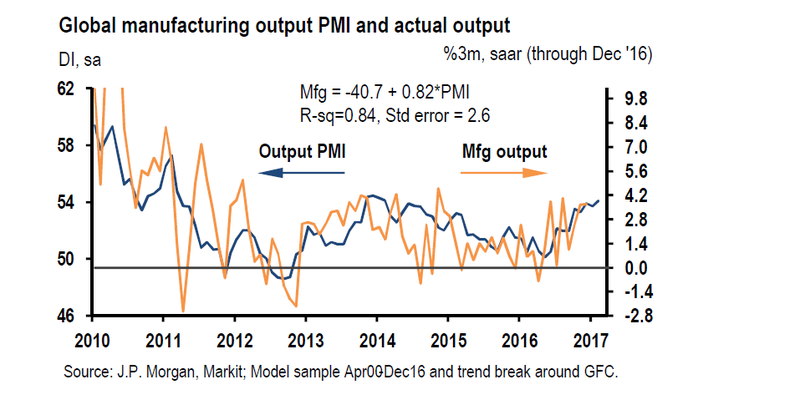 The global PMI now stands at its highest level (54) for three years and, according to JP Morgan economists, it suggests that global manufacturing output is now rising at a 4% pace compared to just 1% this time last year. 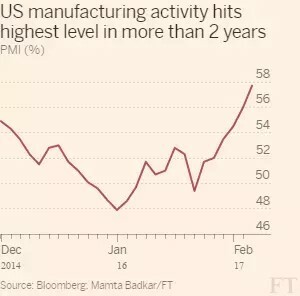 US manufacturing PMI hit its highest level for two years. 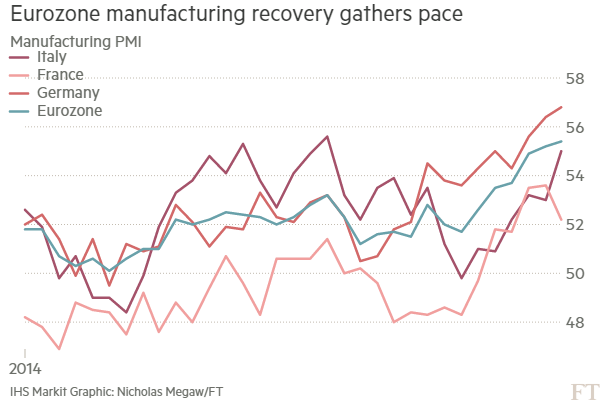 European economies manufacturing sectors also have seemed to turned the corner. 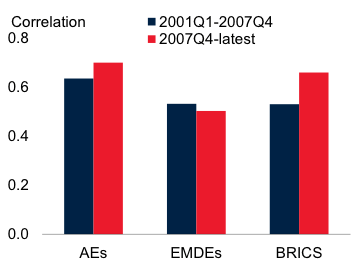 Things are also looking better in the so-called emerging economies. China has not crashed as many expected this time last year. On the contrary, the Chinese economy has picked up and, as a result, there has been increased demand for raw materials. Iron ore prices have rocketed back up, enabling the Australian economy to avoid a recession. In the last quarter of 2016, the Aussie real GDP grew by 1.1 per cent, the strongest rate of quarterly growth over the past five years (although annual growth in 2016 was 2.4%, better than most other advanced economies, but lower than average). India too recorded a pick-up in GDP growth to over 7%. According to the Institute of International Finance, an industry association, growth in GDP across emerging markets surged to an average of 6.4 per cent in January, its fastest monthly rate since June 2011. 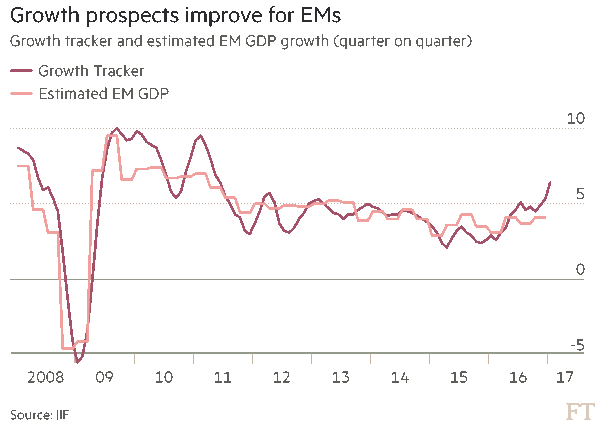 If confirmed, this will show emerging economies reversing a downward trend in growth that has been in place since the global financial crisis. Behind this apparent recovery is a small recovery in corporate profits, which up to the middle of 2016 had been slowing fast. 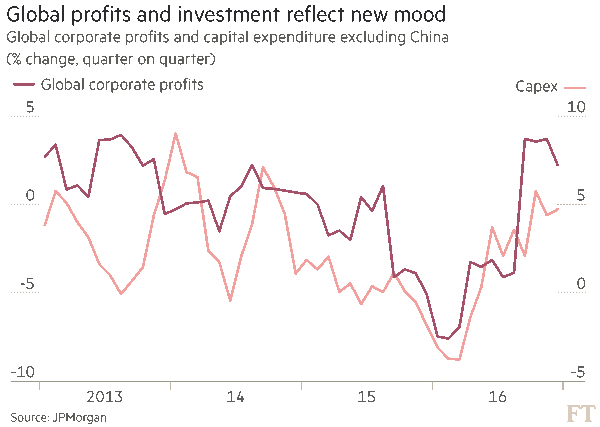 Since then, corporate profits have recovered somewhat around the world and,.according to JP Morgan, business investment has reversed its decline of the last year. Investors have responded. 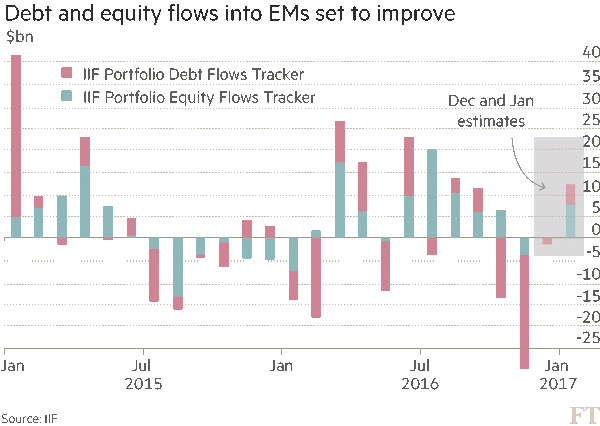 Flows to emerging market equity and bond funds have begun the year positively for the first time since 2013. Foreign investors withdrew more than $38bn from EM stocks and bonds in the last three months of 2016 but sent more than $12bn back to those markets in January, the IIF estimates. Even world trade growth, which has been abysmal and stopping rising altogether at the beginning of 2016, rose 2% at the end of last year (but still way below 3-4% rate in 2015). So it would seem that the ‘Trump rally’ in stock markets is being accompanied by stronger economic growth and an end to the risk of deflation and stagnation. Indeed, it is now expected that the US Federal Reserve Bank may well be confident enough to decide to raise its policy interest rate again this month, having stalled on its planned hikes after December. But as I have argued before in previous posts, financial markets and mainstream economists may be getting ahead of themselves. Is the US economy really going to leap forward from its sluggish pace of 2% or less that it has achieved since 2009? Indeed, revised data for US real GDP growth in the last quarter was just 1.9% year over year, actually below the average growth rate since the end of the Great Recession. It is no accident that the wild claims by Trump that his policies would lead to the US economy soon growing at a 4% rate have already been watered down. Barely a month into Trump’s presidency, his advisers have already downgraded that rather elevated forecast. Steve Mnuchin, Trump’s recently confirmed Treasury secretary who is a former banker at Goldman Sachs, substantially downgraded the Trump’s goal for economic growth to just 3%. And the Federal Reserve has proved to be wrong repeatedly in its forecast of faster economic growth. 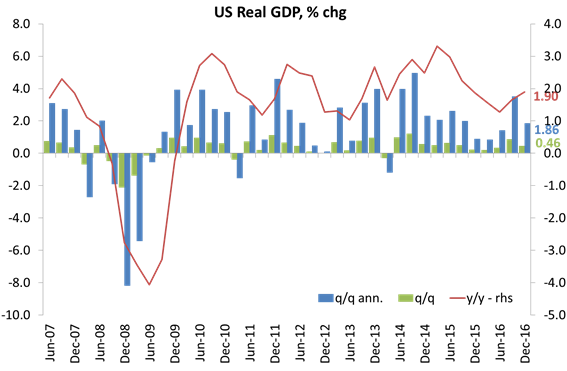 Moreover, business investment growth slowed to a trickle. 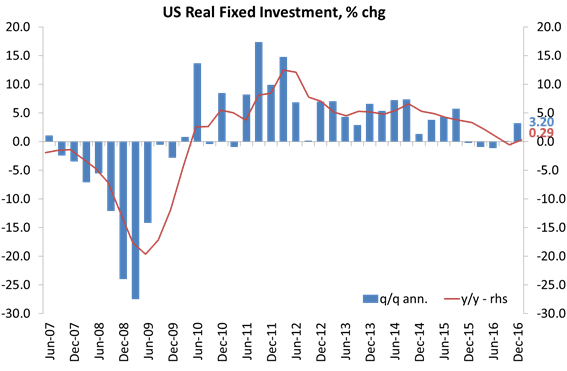 Investment badly needs a boost if the US economy is to sustain any significant growth rate, let alone the claimed 3-4% target of the Trump administration. With business investment so weak, US economic growth is not going to accelerate unless corporate profits leap forward and government investment steps up to the plate. Business investment contributed just 0.17 percentage point to GDP growth in the last quarter of 2016, while government investment has collapsed. That, of course, is the Trump plan (such as he can explain it), namely to cut corporate taxes to raise after-tax profits and to introduce an infrastructure investment programme. We shall see. But corporate profit margins (profit per unit of sales) are not rising but narrowing and the fiscal multiplier effect of any Trump government investment stimulus is likely to be small. There has been little sign of a recovery in real GDP per person in the US since the Great Recession – on the contrary – and that is the real indicator of (average) economic success. And what happens in the US has a profound influence on the rest of the capitalist world. 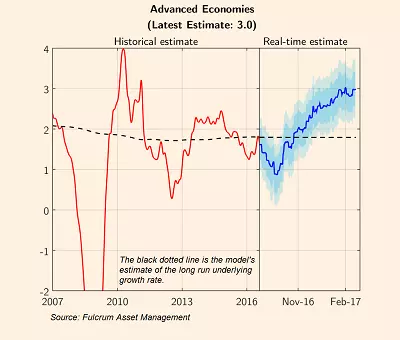 There is a close synchronisation of growth rates between the US and the rest of the world economy. Recent research indicates that the US appears to influence the timing and duration of recessions in many major economies. Estimates indicate that a percentage-point increase in US growth could boost growth in advanced economies by 0.8 of a percentage point, and in emerging market and developing economies by 0.6 of a percentage point after one year. Notes: Contemporaneous correlations between cyclical component of US real GDP and cyclical component of real GDP of advanced economies and emerging economies. But it also works the other way. A fall in US economic growth will weaken growth rates elsewhere and any crash in the US stock market will quickly spread abroad. Estimates suggest that a sustained 10% increase in US stock market volatility could, after one year, reduce investment growth in the US by about 0.6 of a percentage point, in other advanced economies by around 0.5 of a percentage point, and in emerging market and developing economies by 0.6 of a percentage point. 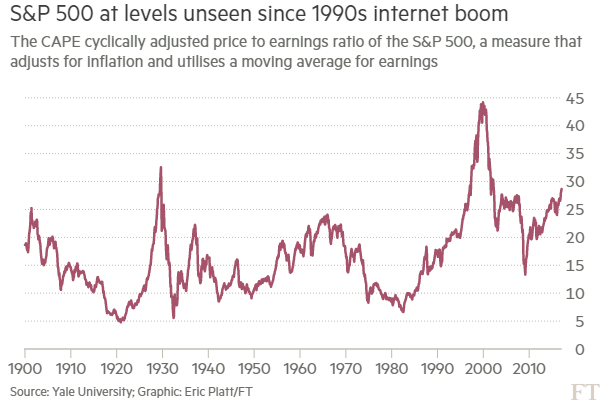 As I have pointed out before, the US stock market is looking ‘overvalued’ and liable to a crash. 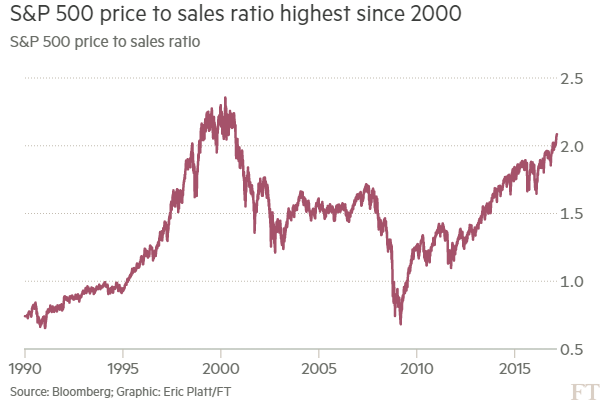 The stock market price compared to sales by the companies in the stock market is back at levels not seen since the last crash in 2000. As I have argued before, the key indicators to tell you if the US and world economy is starting to grow faster or is slipping back are the movement of profits and investment. In the last half of 2016, corporate profits moved back into positive territory. 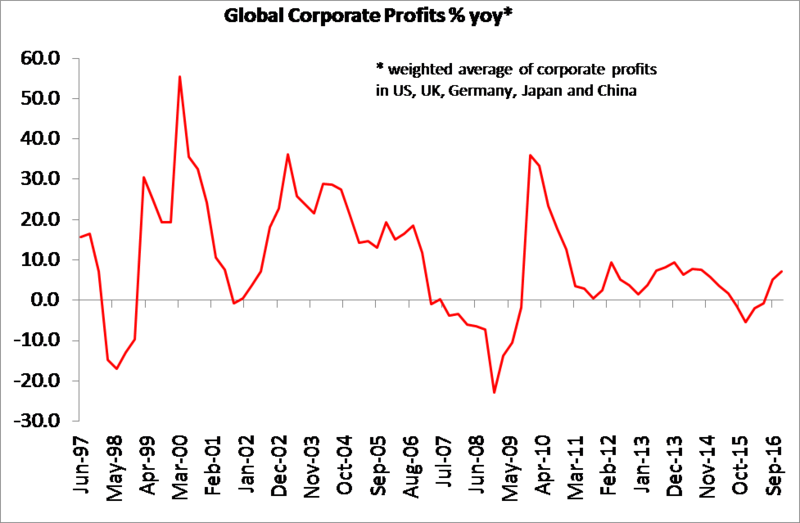 To finish off the batch of graphs in this post, here is my measure of global corporate profit growth up to end-2016. Where this graph goes in 2017 is crucial to an analysis of the future. This entry was posted on March 2, 2017 at 11:14 am and is filed under capitalism, economics, Profitability. You can follow any responses to this entry through the RSS 2.0 feed. You can leave a response, or trackback from your own site. If Trump gets a large program of public investment past the fiscal hawks in Congress (presumably debt-financed, combined with tax cuts for the rich) what do you think we can expect? Short-term growth followed by a later debt crisis and accompanying slump? How would your predictions vary from those of a Keynesian? I was waiting for the “but” to explain why this rise in global growth compared to your repeated statements that the world economy was going to hell in a hand cart, and would surely be soon entering yet another recession, to presumably deepen the “long depression” we are told it is already in, was all fake news. Instead, we get a different explanation. But, you have repeatedly told us, and provided endless charts to demonstrate it, that investment lags the rate of profit by two years. So, how can this current increase in growth and global investment be explained by concurrent rises in the rate of profit? After all, you were telling us not long ago that the falling rates of profit into 2016, must result in reduced investment and a new recession! I think the $1+ trillion capital outflow out of China in 2015-2016 is behind the recent “apparent recovery”. A lot of the outflow ended up in real estate and corporate acquisitions in the US, UK, Canada, Australia, etc. It was a mini stimulus that lead to a construction boom. The bump is fading now because the dizzying outflow is mostly over. …That leaves a whole lot of billions left unaccounted for, and it’s not like that it moved out of China’s foreign exchange reserves and into industrial production, or commercial loans. The uptick may or may not be over, but the source is more likely to be found in the uptick in the price of oil, and the knock-on effect that has on other bulk commodities and energy supplies. Be that as it may, I don’t recall Michael ever arguing that the capitalist economy was going to hell in a handbasket. Rather, he has argued that it, capitalism, is confronting a chronic condition which has become more or less acute– its inability to sustain profitability, and this in turn has caused actual contraction followed by sharply reduced growth and the likelihood of additional contractions. At least that’s my take on what he has written over the years, and I’m in fair agreement with that whatever my disagreements about the relation of that chronic acute condition to immediate levels of investment, future levels of investment, and/or whether another contraction is imminent. Don’t know about imminent; do know a subsequent contraction is immanent. El Bofforino on the other hand thinks 2008 and beyond was nothing but a credit crunch, made into a crisis by the ignorant Austerians who don’t appreciate the natural resiliency of capitalism. That, supposedly, is an analysis sufficient to explain the long-term reduction in the growth of world trade, and the two incidents of actual negative growth in the past 8 years, the continuing malaise in Europe, including the “north stars” of the EU– Finland, Austria, Holland; the persistent slowdown in China, the actual contraction in Brazil…. well we could go on and on. Everything’s just fine, or would be according to Dr. Pollyanna Pangloss Bough, if only the austerians would live the invisible hand to do its work….on planet Boffy. I hope nobody is making investment decisions based off Michael Roberts’s analysis here, because he has it all wrong. We are poised on the edge of a boom. World gold production has been hitting new peaks (although is likely to be on a down-slope about now, which will be reflected in a crisis in about 5 years’ time). This increases the effective market for commodities by allowing central banks to be more accommodating without risking too much depreciation of paper currencies against gold. Inventories have been exhausted. Fixed capital has been consumed without being replaced. Now it will be time to rebuild that capacity and build new spare capacity. The apparent “multiplier” effects typical of a boom will be kicking in. With the boom will come some mix of higher inflation and interest rates (the exact mix is up to the Federal Reserve), so not everything will be rosy for the working class, of course. The challenges will be different. But if there is any time for workers to make concrete gains, it will be in the next few years as the market for labor-power becomes tighter. (After that, we can look forward to another crisis and another period where workers will be out of work, desperate, on the defensive, and tempted to go at each others’ throats for the few remaining scraps of employment on the market). Also, the decline in corporate profit margins that Michael Roberts notes is no problem for the average rate of profit if the turnover period of capital shortens. And indeed, that’s what we are about to see. After declining ever since the start of the Great Recession, money velocity is poised to increase. All of this would be the case regardless of what Trump ends up doing. Trump’s idiotic policies might end up tarnishing the boom from being as effective as it might otherwise have been. But I think the Law of Value (and in particular, the recent increase in world gold production) is objectively leading the world economy into the boom phase of the industrial cycle. Give it about 5 years. Then, as a result of the boom, and the prices of commodities rising above their labor values, gold production will be down, and the system will once again be perched unsustainably on a mountain of credit at high interest rates that eat into the profit of enterprise. Politicians are already talking about dismantling Dodd-Frank, Basel III, and other “macroprudential” legislation. This will accelerate lending and accelerate the boom, but of course worsen the inevitable crash even more. This story happens again and again. The point, though, is that the crash is not here yet. If you base your personal investment decisions and/or your communist political strategies on the premise that the crash is indeed around the corner, you are a fool who will end up discrediting yourself, discrediting Marxism, and making your investments and/or your political strategy turn out all the worse for it. For more information on why I have come to these conclusions, see Sam Willilams’s blog “Critique of Crisis Theory,” and in particular his posts on the phases of the business cycle. Marxism has nothing to do with investment decisions, and communist strategies have nothing to do with the willingness of the bourgeoisie to invest money. World gold production has risen steadily from 2009 and is now about 28% above the 2005 level of production. 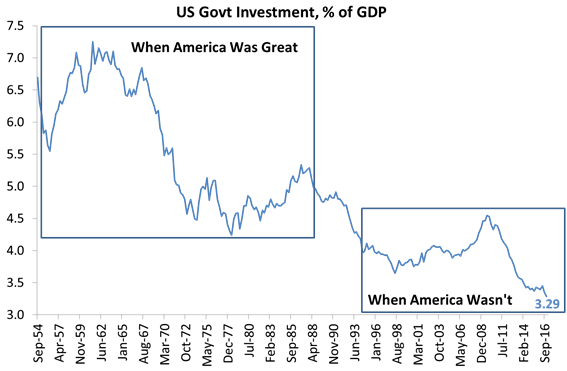 So how come world trade has slowed, and actually dipped into negative territory twice since the beginning of 2008? Gold moves counter-cyclically to the rest of the economy. Increased gold production sets up the preconditions for a boom. But the actual onset of the boom itself drives gold production back down to its cyclical trough as the prices of all other commodities rise above their labor values (meaning, on the flipside, the “price” of gold falls below its labor value during the boom, leading to insufficient gold production and setting up the next financial crisis). And as for Marxism having nothing to do with investment decisions: why not? The Law of Value is a superior descriptive assessment of the world capitalist economy compared to bourgeois vulgar economics, is it not? Why shouldn’t it work for an investor to use the superior insight into the nature of the capitalist economy for financial gain? 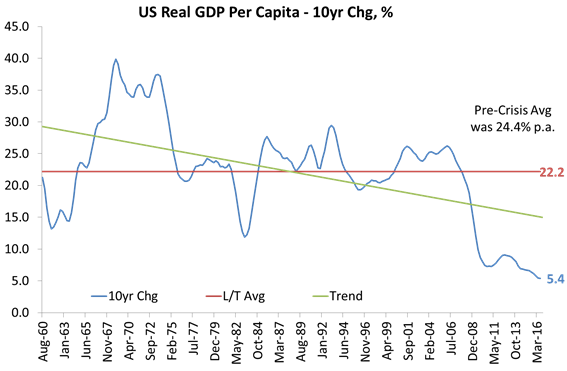 Secular stagnation isn’t one perfectly flat line over a period of years. Growth goes up and down but it’s always ultimately lower then it would have been otherwise. “gold is counter-cyclical”? ?– that’s not the line proclaimed by so-called Marxist “gold-bugs” who attribute the end of the 1847-48 downturn to the discovery of gold in California in 1849, or the end of the “long deflation” at the close of the 19th century to discoveries in Alaska and South Africa. As for this: ” Also, the decline in corporate profit margins that Michael Roberts notes is no problem for the average rate of profit if the turnover period of capital shortens”– yeah, and if people in hell had ice water they wouldn’t be so hot. However, indications are that turnover periods are lengthening. The WSJ reported today that despite high sales, sales are essentially flat over the recent period, that dealer inventories are expanding and that the turnover of an auto, from dealer lot to sale has expanded to 70 days, the longest duration, and lowest turnover rate, since 2009. Because that’s not Marxism; Marxism is the critique of capital that transforms itself into the program and organization of class struggle to abolish capital. But go right ahead, invest away. Wall Street is filled with those who are sure they have a superior insight into the returns on capital. Hell, every few years, courts, streets, and morgues are filled with the shells, husks, and bodies they leave behind. I’ve been reading your blog for a couple of months now and have definitely enjoyed it. I’ve seen you touch on retirement/pension plans here and there but I’d love to see you do a more in depth story on them. I know in my case I am forced to take one and am not allowed to liquidate it until age 59.5, which basically means I’m forced to invest in one of a limited number of markets (stock, bonds, money) that I have moral and ethical issues with for most of my life. Not only does this help encourage my consent, this forced investment may also be a driving factor in propping up the stock market.